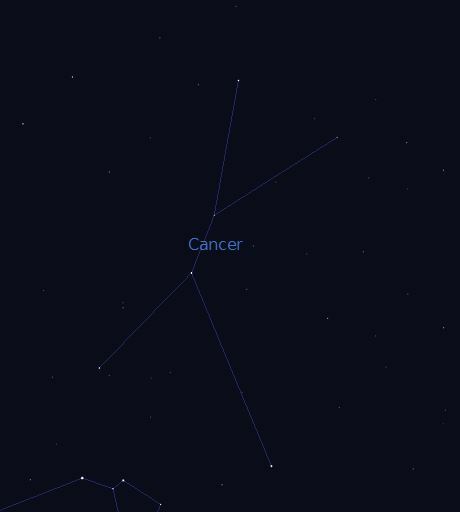 Anyone who can see the constellation of Cancer as a crustacean, will require a bit of imagination. This constellation of Ecliptic does not feature such an impressive appearance as its neighbors and although the stars in Cancer shine so dimly, a number of interesting objects can bee seen hiding within the constellation. Look to the East during the winter months and you will see Cancer. The constellation is not host to any especially striking stars, which is why it could be difficult to find for the lay person. That’s why, one should start by searching for some of the constellations more impressive neighbors and work towards the location of Cancer instead, since it can be found to the left of Gemini and to the right of Leo. Additionally, following the phases of the Moon can help you find Cancer. On 20 February the Moon will appear in the middle of the constellation, but the brightness of our satellite will make it difficult to see the weaker stars in the constellation. 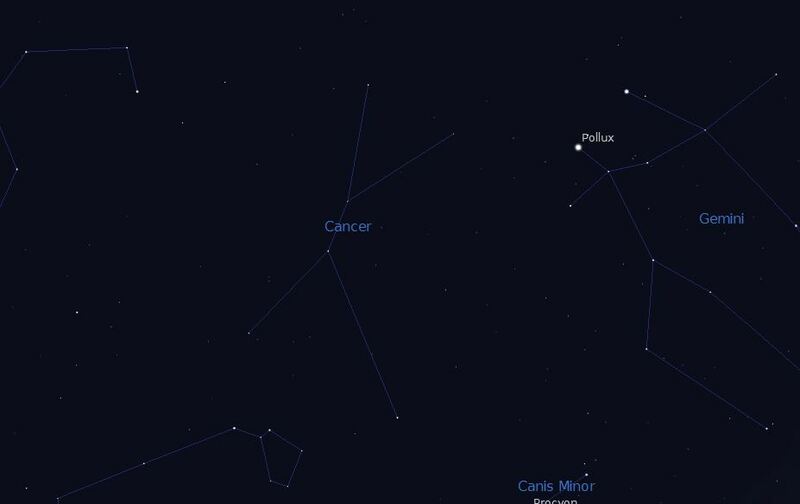 A moonless night would prove best for observing Cancer and you may even notice a little cloudy-looking spot within it. 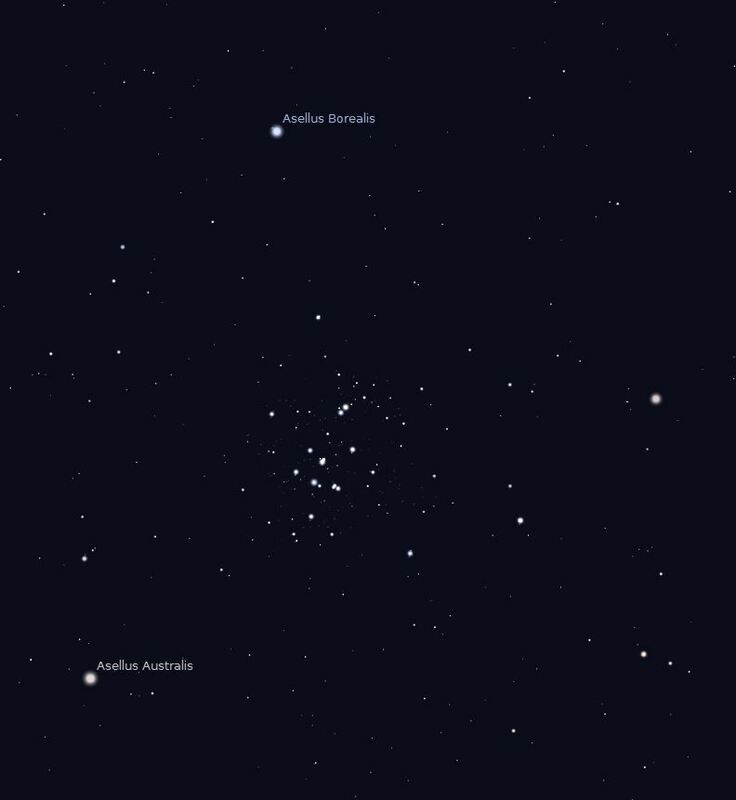 This spot is the star cluster M44, which is made up of around 200 to 350 stars and easily identifiable in the middle of Cancer. This star cluster makes the constellation very special in spite of Cancer’s less impressive appearance. M44 belongs to the largest star clusters and it is, as a result, easy to see with the naked eye, as long as the night sky is dark enough. Of note are the northern Asellus Borealis and southern Asellus Asutralis, which can bee seen in the middle and belong to the brighter stars found in Cancer. The brightest by far is Beta Cancri, a.k.a. Tarf or Al Tarf. Cancer is featured in Greek mythology, linked to the hero and half-god, Hercules. Hera, the spouse of Zeus, hated the illegitimate son and son of a mortal. When Hercules fought the Hydra, Hera sent Cancer to bite Hercules in the leg and weaken him. However, Hercules squashed Cancer with a powerful stomp. Although Cancer didn’t fulfill its objective, Hera placed it into the heavens out of thanks. As a result of its failure, its stars do not appear as bright as others. Both stars of Asellus received their names from mythology. There were once two pack animals, which carried the gods Hephaistos and Dionysus into battle against the Titans. The Titans fled in panic at the sounds of the mules’ screams. As thanks the mules were granted a place in in the manger – M44 – and since then can be seen in the night sky.